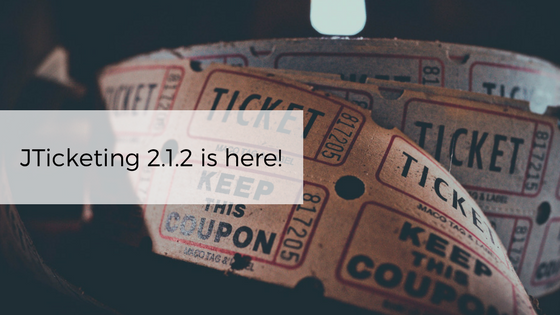 In keeping with our commitment to ensuring our products are secure and bug-free, we are happy to bring you a security and maintenance release for JTicketing v.2.1.2. We have fixed a few bugs apart from fixing issues found in our audits. Please read the release notes carefully before upgrading to the latest version as there are backward compatibility breaks if you are upgrading from 2.0.x or lower versions. It is recommended you upgrade to the latest version of JTicketing as soon as possible to ensure you are on a secure version. Read on for the complete changelog. Bug #125063 - Pin view image is not showing. Bug #126164 - JEvent - JTicketing book module is not getting displayed for the recursive event. Bug #126621 - [All events-filters -frontend]- Display event creator filter field even if admin disables event creator filter from the backend.